Magento is a leader in the e-Commerce world. However, a lot of e-merchants decide to migrate Magento to Shopify, which is hosted shopping cart. Shopify is much more user friendly and easy to manage. Moreover, it has more than 100 free templates, official support and high level of security. 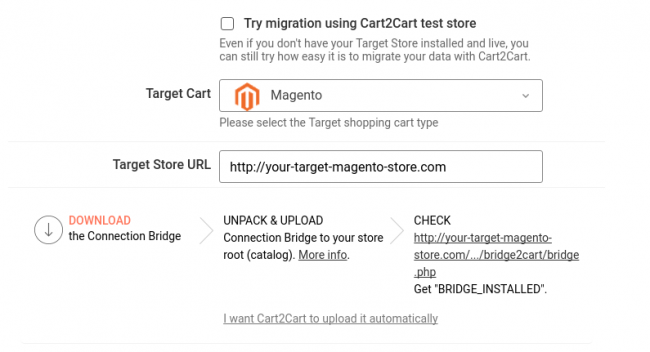 In order to help entrepreneurs migrate Magento to Shopify effortlessly, Cart2Cart provides a possibility to move all data automatically. It means you don’t need high programming skills to perform successful migration. Moreover, it is an online service, so there is no software to download. All you have to do is follow simple wizard. For better convenience watch our video tutorial. 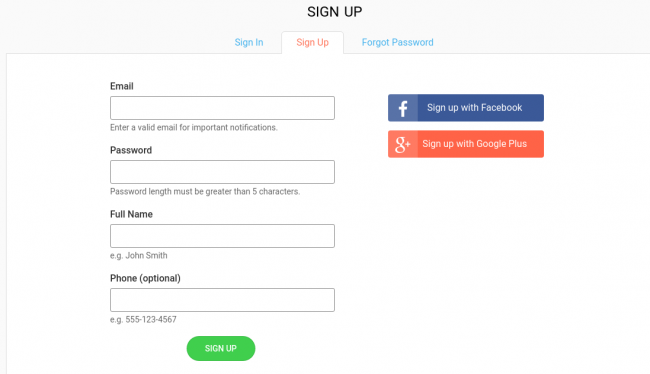 Firstly, you have to register Cart2Cart account or log in with your existing Google or Facebook account. Select Magento from a menu. After that, enter your web store’s URL. Then install Connection Bridge on your Computer. You have performed that in order to give us access to shop’s data. First of all, you have to download it. After that extract bridge from zip archive and paste to the root directory using FTP client. For better convenience watch our video tutorial on how to install Connection Bridge. Pick Shopify from the drop-down menu and insert online store’s URL. Then, click "Intall plugin" button. 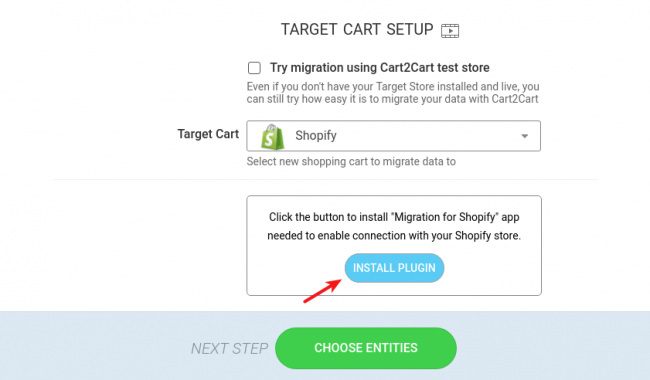 This free plugin will allow you to continue with the migration procedure directly from your Shopify Admin Panel. 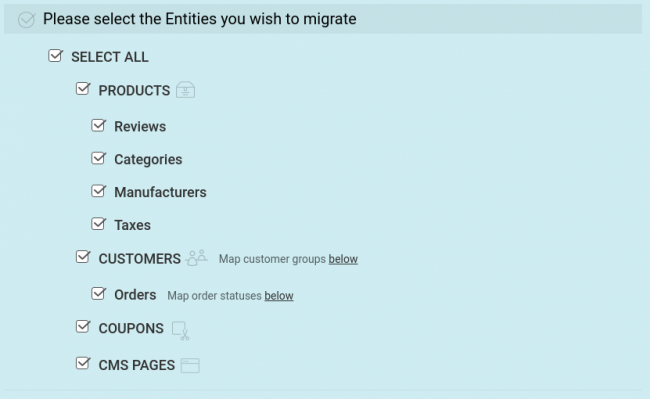 Now, within your Shopify Admin Panel continue with selecting entities you wish to transfer to Shopify. If required, pick up some You are additional options which can broaden your migration possibilities. 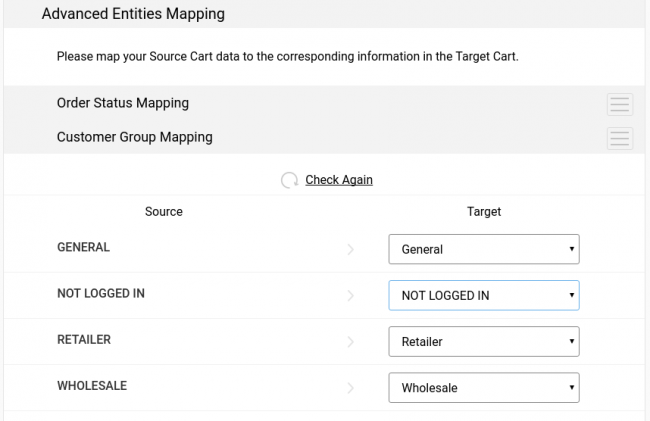 Now you need to match your Source cart data to the corresponding fields of your Target store. 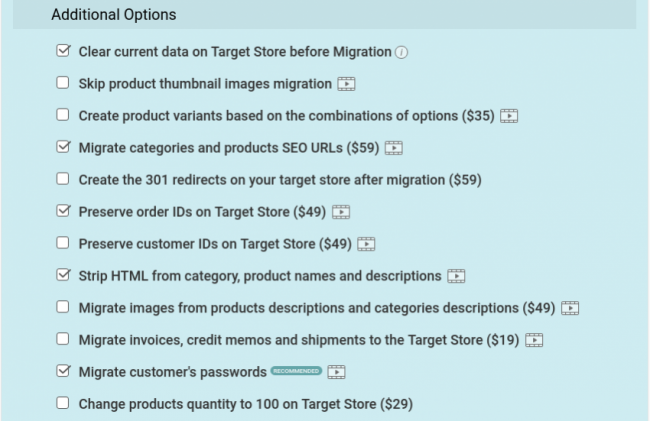 Cart2Cart doesn’t actually migrate your Customer groups and Order statuses, instead of this it allows you to set accordances - that is to match your Source store Customer Groups and Order statuses with the corresponding ones on your Target store. If you don’t have the needed Order statuses on your Target store, you can add them and click “Check again” to renew the available Customer groups and Order statuses. Cart2Cart provides an opportunity to try how everything works while totally free Demo Migration. Simply click “Start Free Demo. Now you will see the progress bar with your current Demo migration. The whole process will take no longer than 30 min. 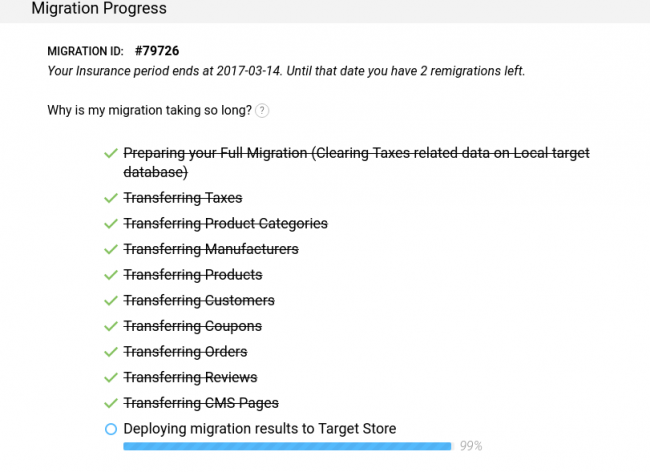 If you’re satisfied with the Demo, you’ll get an opportunity to proceed with Full migration. Insurance plan gives you the opportunity to restart the same migration all over again in one click within a defined period of time. This additional service would be helpful as precautionary measure in case of force majeure during the data migration caused by wrong platform installation, conflicting plugins, etc. 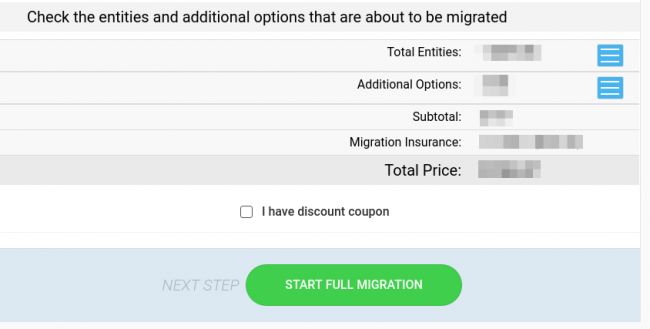 However, keep in mind that Migration Insurance is optional, and you can skip it if you don`t want it. 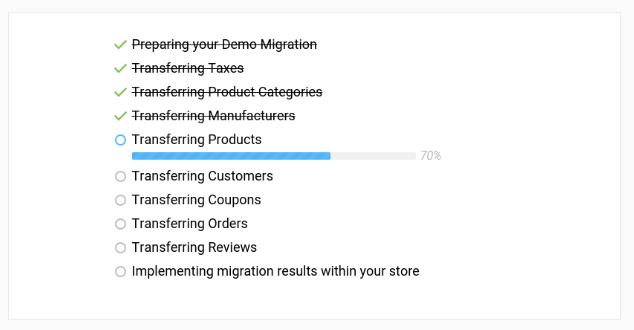 Сheck the entities and additional options that you want to migrate to your Target store by clicking on the blue “hamburger” buttons and then and click on “Start Full Migration” button. Data transfer will be started immediately. Right after Full Migration is completed you will receive an email notification. After that, you are able to check results of data transferring.